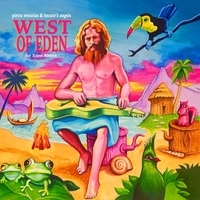 West Of Eden is a new song by Pietra Wexstun & Hecate's Angels. A tribute to the songwriter, spiritual beatnik and "natureboy" Eden Ahbez "Amid the rocks and granite pools / There lived a merry band of fools / Or so it would appear .."
LA based Hecate's Angels have an arty, futuristic cabaret sound, based around the creative vision of musician, songwriter Pietra Wexstun (responsible for vocals, keyboards, autoharp and dulcimer, with songwriting and production throughout) and augmented by instrumentation including wind, strings, guitar, and diverse percussion. You'll see strange mythic pictures in your mind, go back in time, speak in tongues and then wonder who slipped that great mickey in your hi-ball glass.